So far in 2019, the Utilities sector has underperformed the other sectors with the exception of Health Care. As of now, it is hovering around a 10% YTD gain; several percentage points less than the other sectors, but still very impressive for a defensive sector. As shown in the chart below, the sector reached a 52-week high in late March but has yet to move back up to these levels. Looking at the individual stocks within the sector, most of the companies have held solid uptrends for the past year. 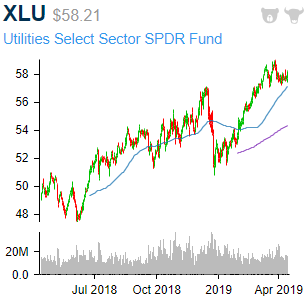 For the most part, the sector’s individual names have very similar chart patterns to XLU, pulling back in solid uptrends and finding support near the 50-DMA. There are a handful of more unique charts though. Two names in the sector that have made more headlines than any others in the past year have been PG&E (PCG) and Edison International (EIX) given their accountability in the cause of last year’s devastating California wildfires. While risks are still at play, the stocks have found a bottom and have been in an uptrend since late 2018. News out late last week of potential relief of the companies liabilities led the two to surge, bringing them back to interesting levels. EIX has come all the way back up to levels prior to the wildfires and PCG is back into the range from the first major collapse in the stock. While the charts are unarguably messy, the two no longer seem to be the falling knives that they were not long ago. 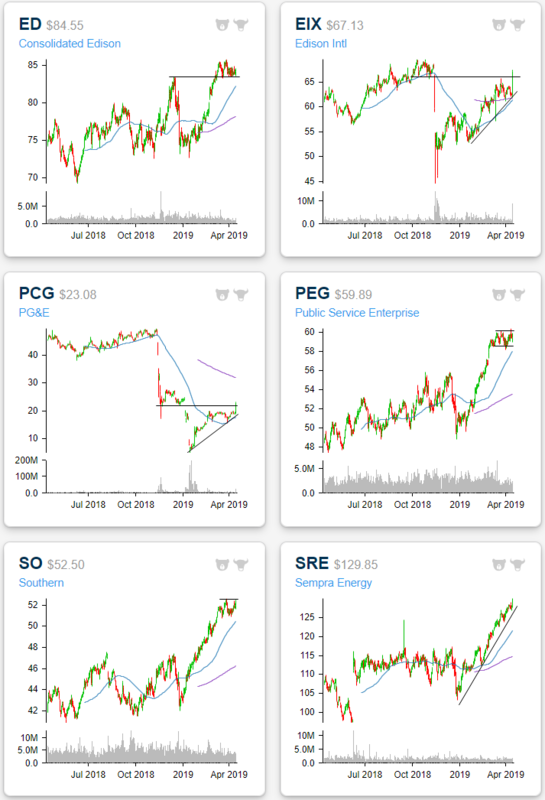 Others in the sector have also been on solid runs so far in 2019 like Consolidated Edison (ED) and Public Service Enterprise (PEG). More recently, these two have in fact stalled out a bit after getting fairly overbought. But in the case of ED, it is has found strong support near its prior highs. While it has yet to make a strong push back to highs from around this time last month, it is at the upper end of the range the stock has been at in the past three weeks. Additionally, last quarter the stock reported an earnings Triple Play, the only Utilities stock to do so of the 100 most recent Triple Plays. In other words, the underlying company is still strong even if the stock price has taken a breather. Similarly, PEG has traded in a tight range between $58 and $60 since early March. After consistently working its way off the bottom of this range since the start of April, in today’s trading, the stock has finally broken out of this range moving above $60. While ED and PEG have been sideways, Southern (SO) and Sempra (SRE) are breaking out to new highs in the past few sessions; continuing along in their tremendous uptrends this year. The two are now up 21.02% and 20.95% YTD, respectively. There is only one stock (AES) that has done better in the sector YTD. Both of these stocks’ explosive runs began after they overtook resistance at their 2018 highs. SRE had actually been flat for most of the year in 2018. Both SO and SRE are in fact overbought at current levels, but not to an extreme degree. Taken from our Chart Scanner tool, we show the charts of these stocks below. Start a two-week free trial to Bespoke Premium to access our interactive Chart Scanner, Earnings Triple Plays, and much more.